Elbe Junction, a century-old building that Louie and Traci DeWitt have turned into an artisan market and showcase for local artists, is up for sale. When Louie and Traci DeWitt bought a century-old building in Elbe four years ago, they knew they had a lot of work on their hands to realize their vision for a one-of-a-kind local store. The Mineral residents gave the old building an 8-month remodel, fixing everything from the electrical work to the plumbing, to the windows and doors. They worked equally hard to keep its historical look, right down to the original paint color and the pockmarked wood floors, scarred by the studded boots of loggers in the early part of the 20th century. “We have a lot of pride in what we’ve built, and we’re proud to show it off when people come in the store,” said Louie DeWitt. After serving as a meeting hall for the Independent Order of Odd Fellows (the front of the building still reads IOOF), it became a general store, changing hands over the years. The DeWitts wanted to keep that tradition alive, but they weren’t satisfied with simply stocking a few conveniences. Anthony Koopman, who spent much of his childhood in Mineral, fondly remembered the building as “a rustic old general store that you’d go through to get your fishing gear.” The DeWitts’ vision was a surprise, he said, but one that’s been well-received. 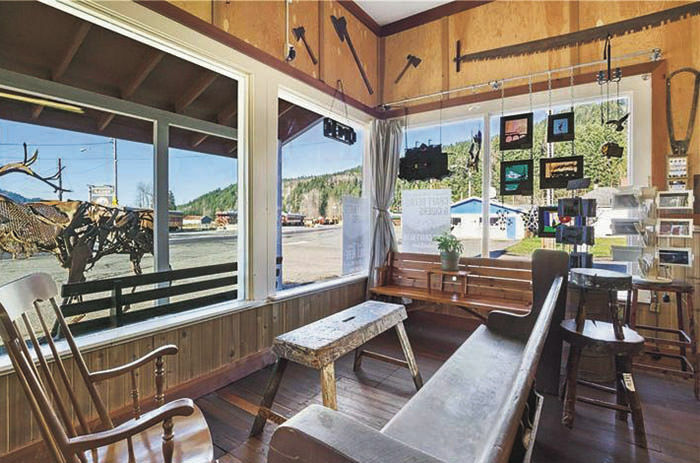 The couple named the store Elbe Junction, a nod to the Mount Rainier Railroad and Logging Museum across the street. They’ve brought in regional specialties for coffee, craft beer and ice cream, and they feature the work of about 40 local artists and craftspeople. Jane Hodges, who owns the Mineral School, which hosts a residency program for artists from all over the country, said the Elbe Junction has been a huge addition to the area. While Elbe Junction brings in much of its revenue from day-trippers looking for supplies on their way to Mount Rainier, it’s also become a place where year-round residents know they can find locally-made goods. 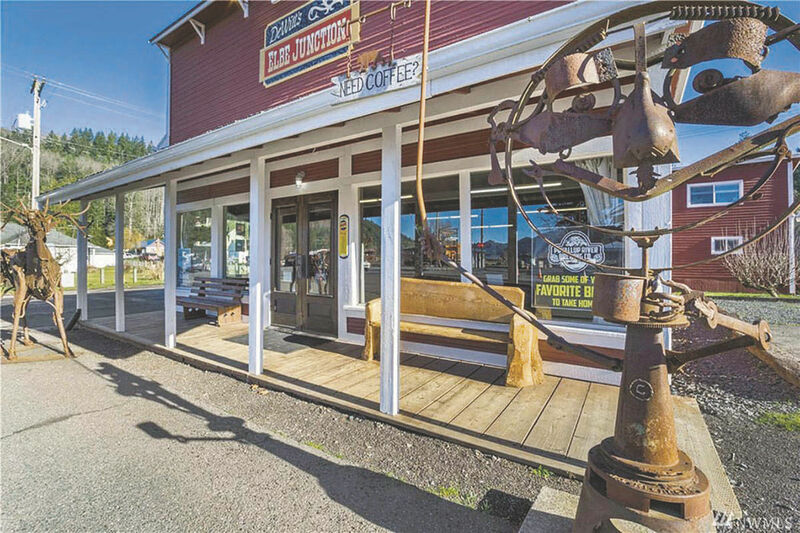 The store features art and craftsmanship produced in the area between Mossyrock and Graham, with nary an urban center to be found — but plenty to show off the virtues of the sparsely populated mountain region. Koopman doesn’t think the thriving art scene on display in the store is a coincidence, noting the do-it-yourself spirit of rural residents who know how to fix a sputtering engine or creaky chair. After years of living in the city, Koopman was astounded to come back and find what was on offer at Elbe Junction. “It’s really kind of amazing to have them be able to blend the rural, blue-collar historical aspect of that building with a spot where tourists from anywhere in the world will say, ‘Wow, there’s some amazing products here,’” he said. After four years of running the show, the DeWitts are looking to sell the institution they’ve built, citing the time-consuming demands of the shop and the desire to travel and see family spread out across the country. Louie DeWitt said he’s not zeroed in on a particular type of buyer, noting that the name Elbe Junction could lend itself to any number of businesses. For Koopman and Hodges, they’re thankful for the place the DeWitts have created, and they’re hopeful the next owner keeps much of that tradition intact, particularly the focus on local art. “I hope whoever comes in and buys the store will continue the spirit of what they’ve done,” Hodges said. Koopman said it would be a “mistake” not to maintain the store’s current appeal, which has made it a “melting pot” for tourists and locals alike. Elbe Junction is currently listed by John L. Scott Real Estate for $499,000.